uses the same nicotine found in 99% of vapor juices altered to increase efficacy. range will satisfy all of your high nicotine, small device needs. 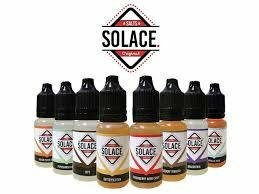 Solace Salts are NOT MEANT FOR DRIPPING ATOMIZERS OR SUB-OHM TANKS. and delectable with every inhale. custard tobacco. Perfected for all vapers! Strawberry Hard Candy Fusion of fresh strawberries and sweet jawbreaker candy flavoring, this dynamic flavor will give you that irresistible jolt of euphoria with every exhale. Peppermint Patty Minty and refreshing mouth watering pepper mint patty. Vanilla Bean Creamy and sweet flavor reminiscent of a cool summer day or evening.